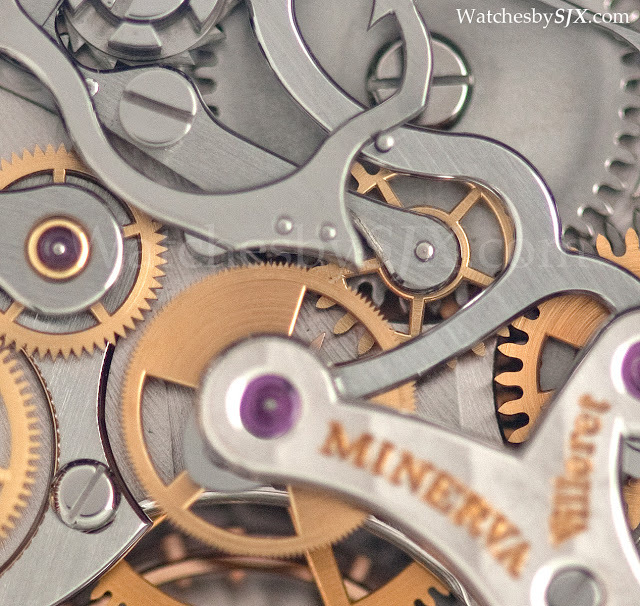 Montblanc acquired Minerva a few years back and then unveiled a high-end line of traditionally constructed and finished watches named Villeret 1858. This has been met with some scepticism – Montblanc after all is a pen company. 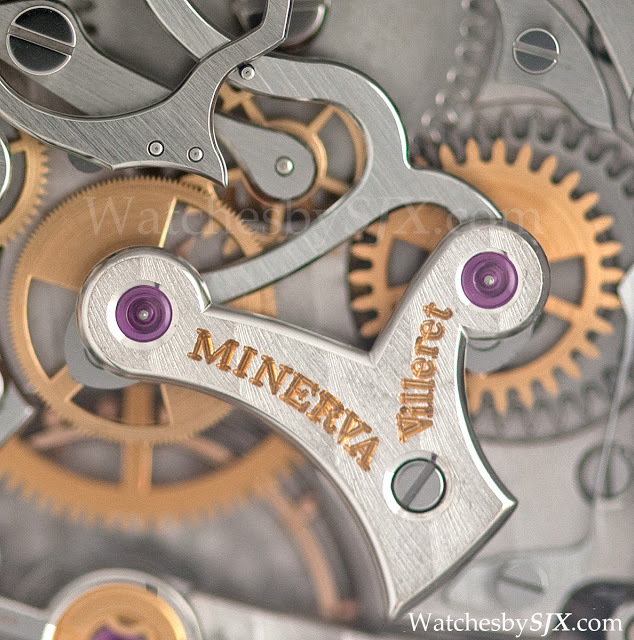 Only 200 or so Villeret watches are made each year and they start at about EUR40,000. Not accessible or affordable by any measure. 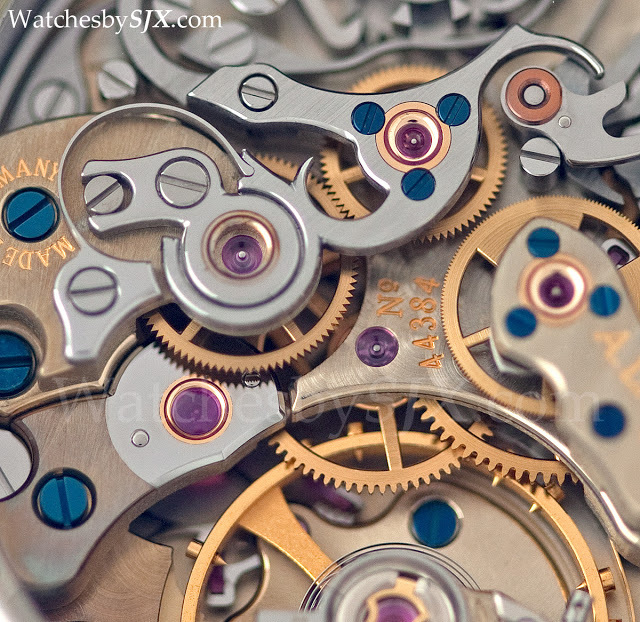 But if you look closely at the Villeret watches, they acquit themselves very, very well, demonstrating the best of watchmaking finishing techniques. 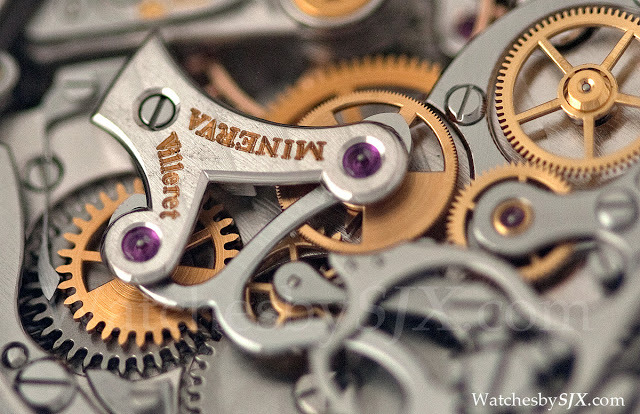 I was loaned a Villeret Vintage Pulsographe for a review (which has been published in The Peak Selections: Timepieces, available in Singapore newsstands and bookstores) and had the fortune to examine the MB M13.21 calibre up close. 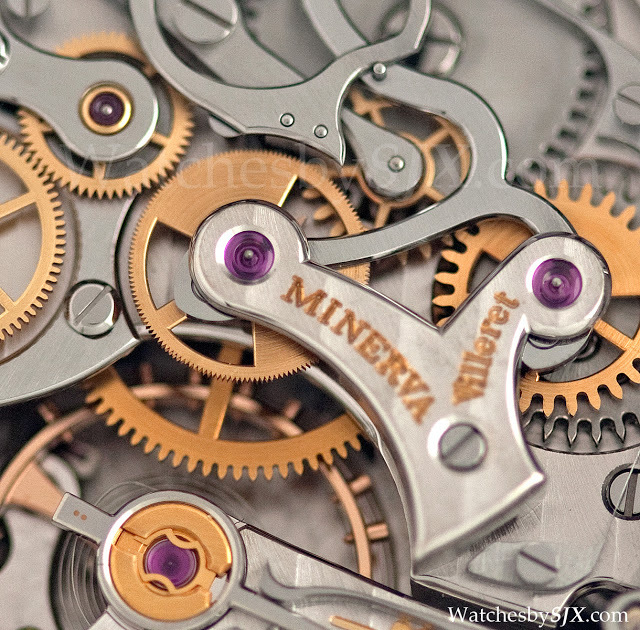 Though the dial and case design can be improved, the movement is exquisite. Note the carefully executed finished everywhere – the striping, angling, straight graining. Everything is beautifully done. 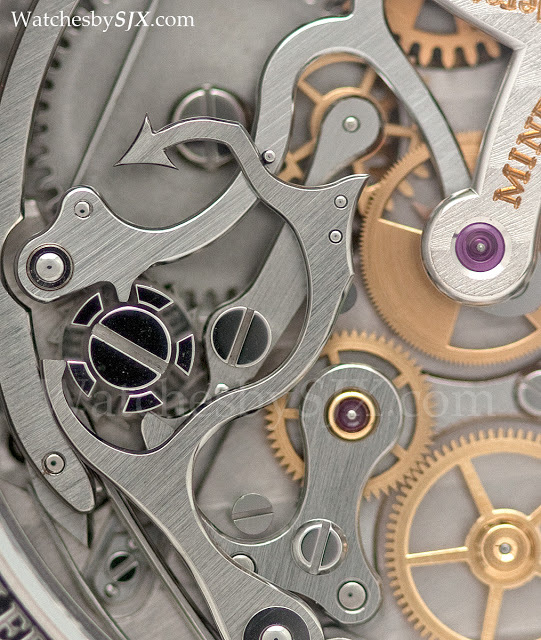 One detail of the movement I particularly like is the finish on the barrel ratchet wheel and also the polished teeth on that wheel, shown below. 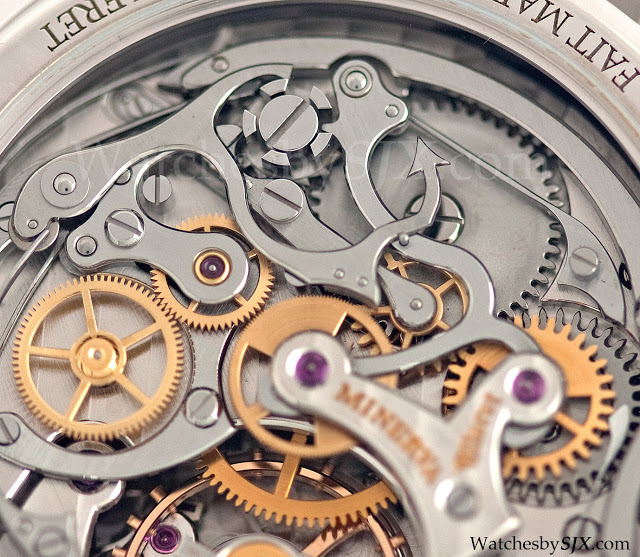 Personally I could not find fault with the movement decoration – and I was looking hard – save for one point. The pallet fork bridge is decorated with perlage, which blends into the base plate which is also finished in perlage. Typically the pallet fork bridge is finished differently from the base plate so that it stands out. But this is a personal preference rather than shortcoming in finishing. The pallet fork bridge is still very well finished – the edges are all angled and polished, and the countersinks for the pins and screws holding the bridge are bevelled and polished as well. 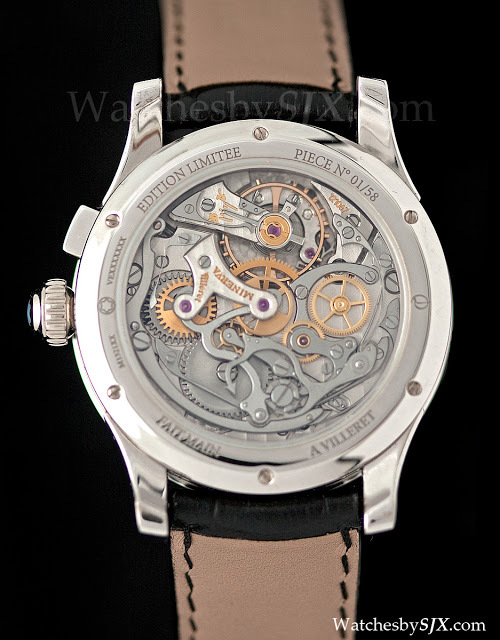 Note that the watch I was loaned, which is depicted in the photos below, was a steel case prototype, not a white gold production watch. 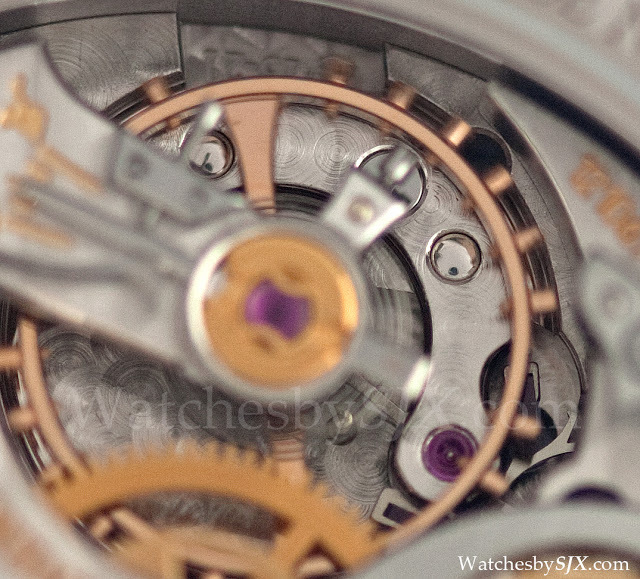 Consequently the movement is not as pristine or clean as it should be. But still the excellent quality of the finish remains obvious; the production pieces, if anything, are even better. The decoration is perfectly suited to the mid-20th century aesthetic of the chronograph movement – traditional, classical and high quality. 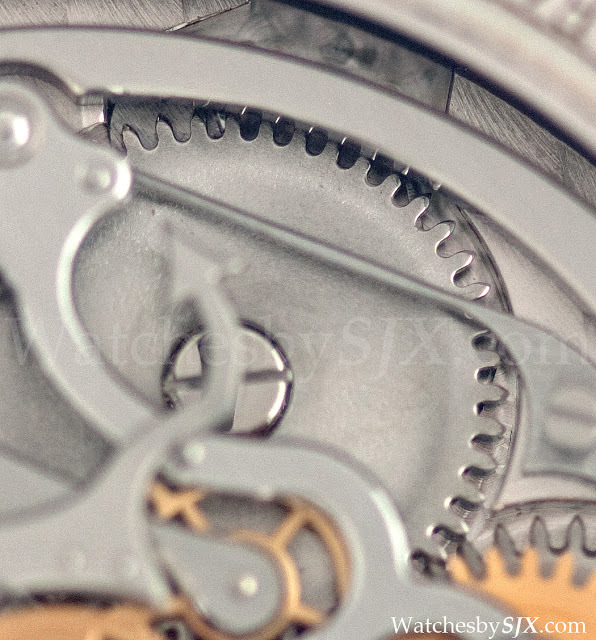 In fact the movement compares well with the Lange Datograph, which I consider the gold standard for a manual-wind, traditionally styled chronograph movement. 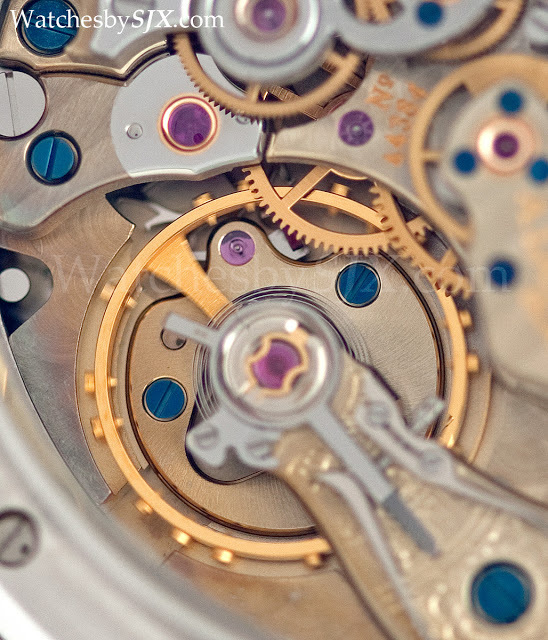 However, the Datograph enjoys two key advantages – design and materials. 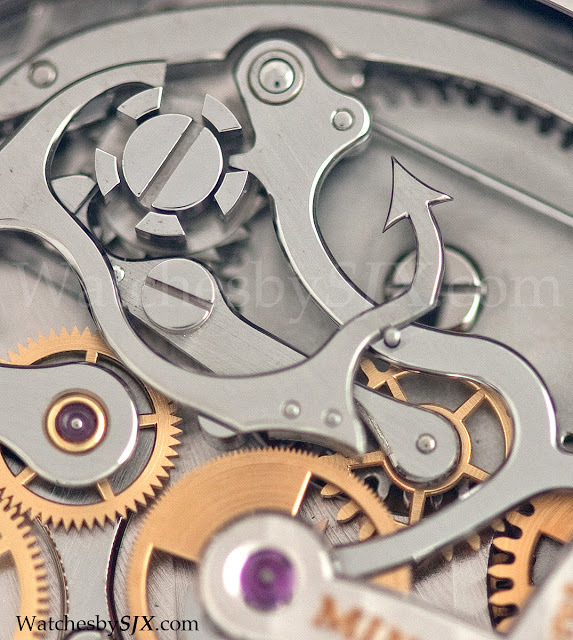 The L951.1 movement is a modern movement designed purposely to look good hence the many curves and points in the chronograph levers. 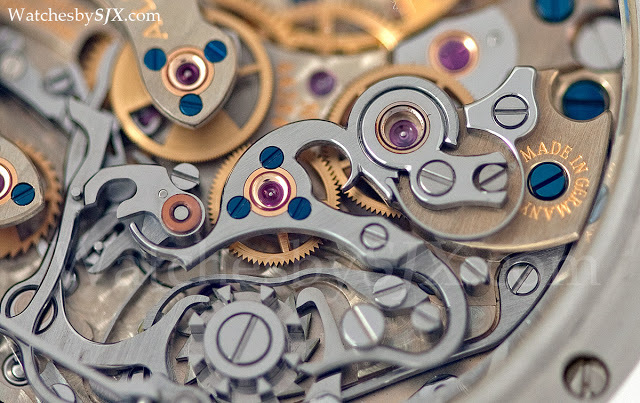 Combined with the vivid colours of German silver and blued steel screws, it looks brilliant. 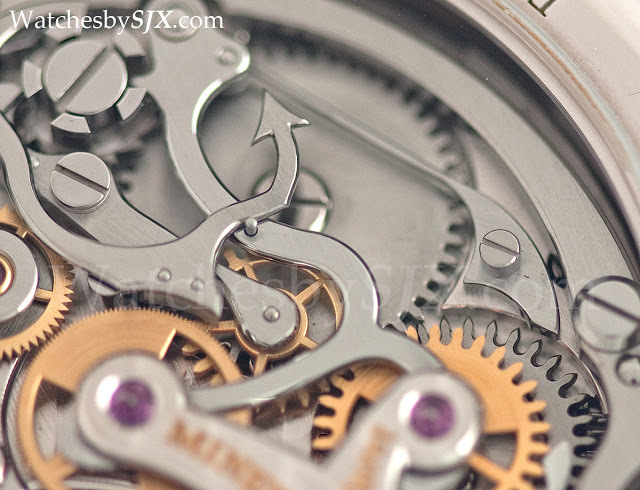 Yet even compared to the gold standard, the Montblanc does exceptionally well. 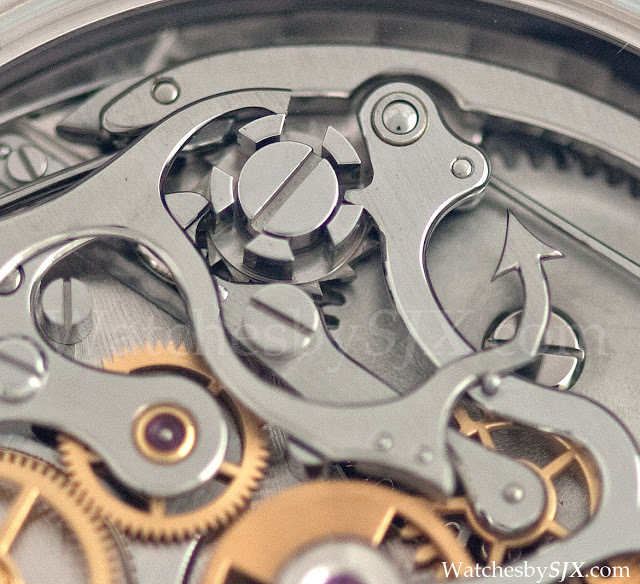 And seta against the best Swiss competitors the Montblanc does even better, it is just as good as a Breguet or Vacheron (I have yet to examine the new Patek chronograph calibre carefully). 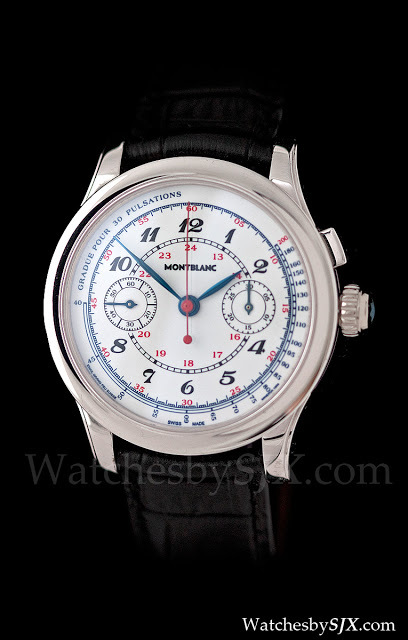 Note that the Montblanc retails for about 40% less than the Lange, and is similarly less than the Swiss competition. If there is one criticism I can make is that the Montblanc is technologically a step back relative to its peers since it is basically a vintage calibre that has been modernised. But it is finished magnificently and looks gorgeous. 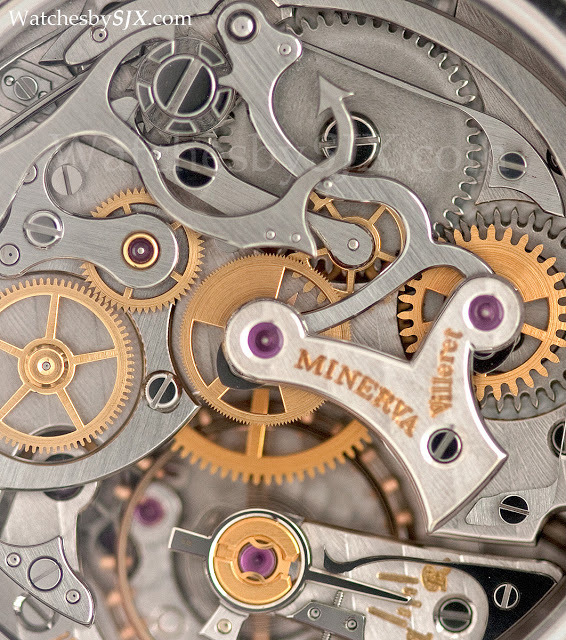 If Montblanc Villeret can introduced a modern calibre similarly finished, it will be dramatic and astonishing I am certain. I will let the rest of my photos do the talking.